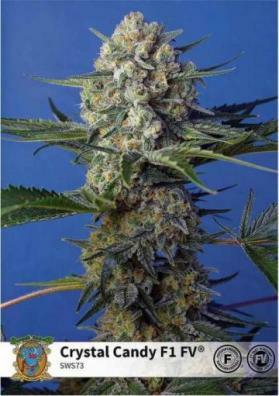 The marijuana Sweet Cheese Fast Version is a hybrid variety F1, result of the crossing between a selected elite clone of Sweet Cheese and a selected strain of autoflowering of 3rd generation. All the taste of Sweet Cheese even faster! 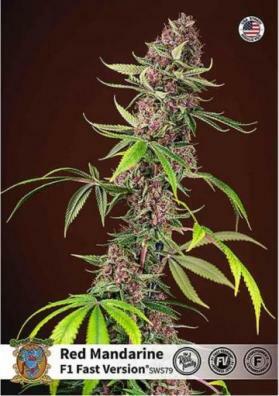 Sweet Cheese F1 marijuana seeds are a strain developed by Sweet Seeds Bank within its already famous Fast Version. 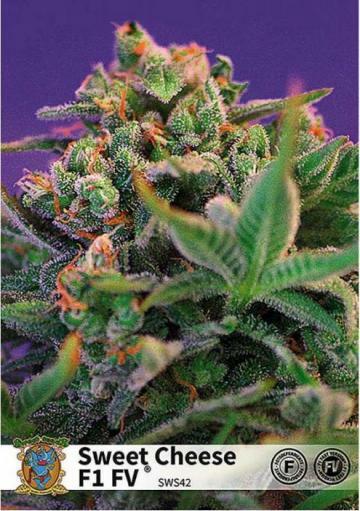 This type of strains were impelled obtaining a hybrid F1 of the cross between a feminized variety and an auto, reducing several weeks of flowering and maintaining the photoperiodic characteristics of the plant. In the specific case of this strain, the feminized Sweet Cheese has been crossed with its autoflowering sister. In relation to the characteristics of Sweet Cheese F1, this plant presents a typical hybrid vigor, with a medium distance between branches and thick and strong stems. At the end of its flowering, Sweet Cheese F1 has long, very dense tails, covered with odour-filled resin and, in the case of low temperatures, will show incredible purple colors. Sweet Cheese F1 is a variety very easy to grow and care for, which is harvested very early so it is an ideal strain for growers in colder and wetter climates since it can be harvested before the arrival of rains. The production of Sweet Cheese F1 is high if we bear in mind that it is a plant that is ready well before the end of summer. Indoors, with the help of grow lights and in just 8 weeks, is a plant that can give away up to 600 grams per square meter. If you grow it outdoors in sunlight, this variety can be harvested up to a month before the end of summer with yields that can reach 800 grams per plant. In other words, not bad for such a fast plant! Sweet Cheese F1 is a plant of medium power, with a balanced effect that will take you from a world of laughter and good disposition to a more relaxing and bearable end. The most remarkable characteristic of Sweet Cheese F1 is its incredible aroma and taste. Its intense smell of aged cheese with spicy touches will make the delights of all who try it and surprise those less familiar with this type of aromas.